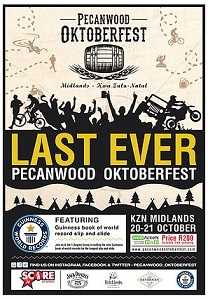 The organisers state: “It’s the last ever Pecanwood Oktoberfest Lifestyle Festival, and we want to celebrate it with you! We are going out with a bang this year, not only are we bringing you all the usual fun and festivities that the past Pecanwood Oktoberfests have brought, but we are also introducing the world’s longest Slip & Slide ride as we’ll attempt to break the Guinness Book of World Records together, with a 650 metre Slip & Slide. “Whether you are a sporting enthusiast, beer connoisseur, thrill seeker, foodie, or just want to enjoy some of South Africa’s top music acts live on stage – there is something for everyone, of all ages- this is the place to be. “This epic last edition of the Pecanwood Oktoberfest will also have a vast selection of beers from around the country, along with a Wine and Coffee Tasting tent featuring coffees from around the world. Visit www.pecanwoodoktoberfest.com for more information.